If you’re looking for easy ways of cutting calories, consider buying mini versions of your favourite foods. Alternatively, look out for ‘Thins’. This is another trick manufacturers are using to help us downsize our portions and calorie intake, while still enjoying the food we like. 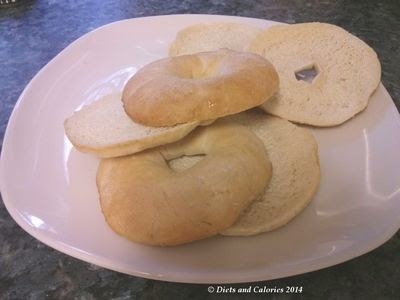 Recently the New York Bakery introduced Mini Bagels (see review) and now Kingsmill have introduced their ‘Bagel Thins’. 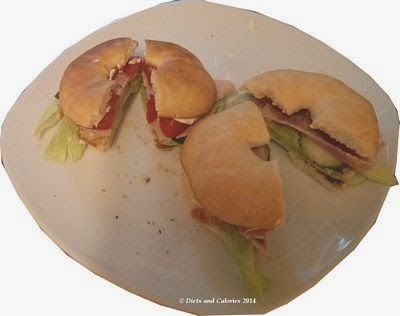 Each bagel has 122 calories compared with 231 calories for the regular sized bagel. As I’m writing this, they are only available as white, so no wholemeal or seedy types yet. Although I try to avoid buying white, unrefined food, I picked up a pack of these as my family do enjoy eating bagels. Each pack contains 6 pre-sliced white bagel thins. This is helpful because, due to their thinness, it would be quite difficult slicing through evenly. I made up some bagels for lunch one day, half toasted and half not. I piled in the fillings, in this case it was lettuce, ham, spring onion, tomato and low fat cream cheese with a sprinkling of black pepper. This took the calorie count up to around 180 for the filled bagel. A word of caution with toasting these bagels. They become very hot, fast! In fact, there is even a warning on the pack about this (not that I noticed until after I’d burned my fingers). And because they’re so thin, they toast almost right through if you’re not careful. This ends up turning the whole bagel into a piece of crispy toast and you lose that nice ‘doughiness’ in the middle. They taste like regular bagels so are probably best eaten untoasted if you're after the regular bagel texture. Personally, I think the Warburtons mini bagels are a better idea as they’re fatter and they keep their texture inside when toasted. They have a similar number of calories to the Kingsmill Bagel thins, ranging between 114-119 per bagel. However, there isn't as much room to pile in any fillings. I especially love the seeded variety which is often difficult to find. They now have another new variety called Half & Half which is made with 50% wholegrain and 50% white flour and still with 100 calories per thin. Nutrition Information per bagel: 122 calories, 4.8g protein, 23.4g carbs, 3.0g sugars, 0.7g fat 0.2g saturates, 1.4g fibre, 0.42g salt. Other information: Suitable for vegetarians; Kosher. Contains gluten. May also contain sesame and milk. Seen in Tesco and the Co-operative stores.